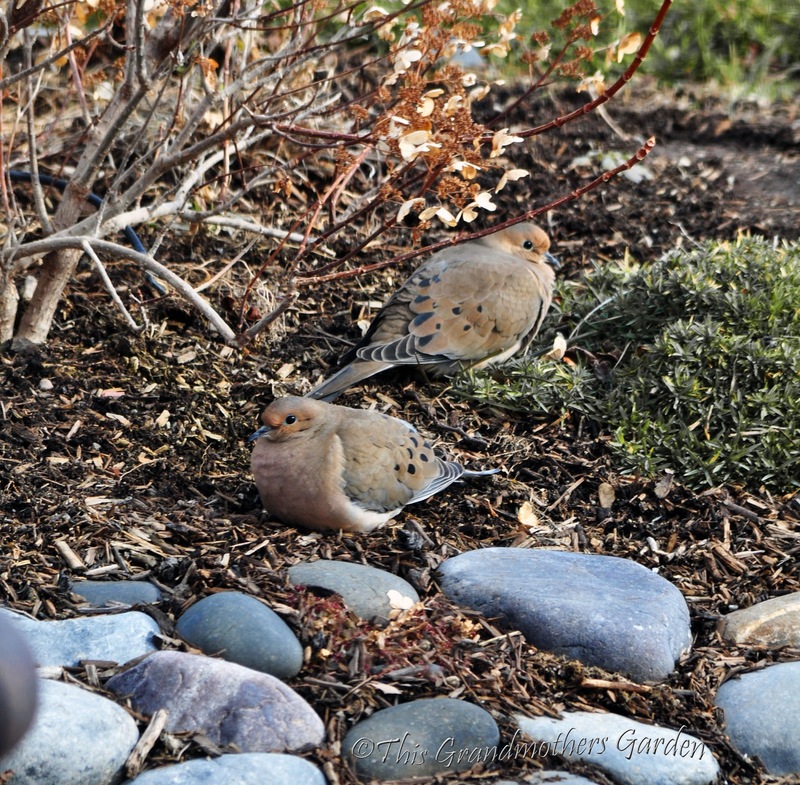 The Doves must like it here... they decided to stay through the Winter. And we're having so much fun watching them!. 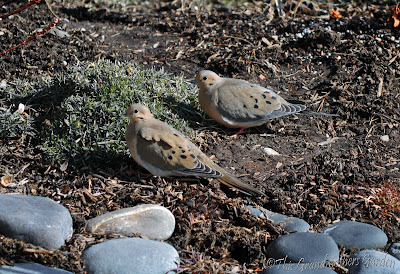 They are Mourning Doves also called Western Turtle Doves. They are 11 to 13 inches in length which includes their 5-7 inch tail. They are migratory birds and usually fly south for the Winter. But sometimes they choose to overwinter. We're so glad they did! though we only see them when the sun shines. that does look cold on their little feet. They enjoy the seeds that the little birds drop from the feeder. It is believed that they mate for life. The male assists in building their nest. and diligently helps incubate and feed their little ones. They will always have a home in my gardens. As long as they choose to stay. We're hoping for babies this Spring! 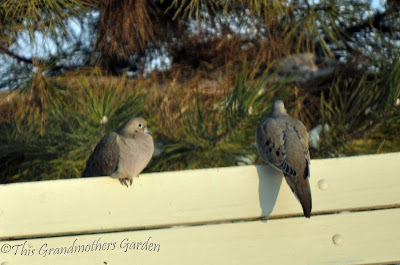 We have Mourning Doves year round here...I can never get a good photo of them...Yours are beautiful. I love having doves and you aptly described them as the clean up crew. It is the same here with the Morning Doves. They sit on the wire all day watching the activity below of the sparrows making a monumental mess. Then after the sun starts setting, they come in en-mass for all the leftovers, scratching the snow to get what ever is left. Such peaceful birds. Your photos of them shout that trait loud and clear. Doves are amazing birds and what we can learn from them as mates for life. I do not have feeders but they frequent the gardens and pond although when our resident rabbit is around he loves to chase them the little scamp. I hope we see them all soon!! Dear Carolyn, Two turtle doves...how perfect as we approach Valentine's Day. They are so elegant as they tiptoe through the garden. Lovely! They are just so sweet! I have three that come to visit daily. Not sure why there are three together, maybe one lost a mate and joined up with the other two. Or maybe a young one from last year that still has not found a mate. I love the cooing they make, makes me feel relaxed and soothed. Beautiful photos! Birds in the snow are so pretty. 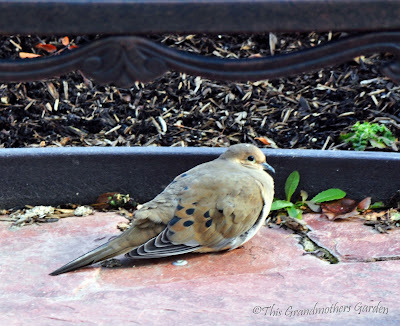 I love mourning doves for their gentleness. Your pictures are lovely. This is my first visit to your blog but will surely not be my last. At Southern Meadows we have Mourning Doves year round ambling around the bottom of the feeders. They are wonderful birds. I didn't know they mate for life. That is so sweet but will make me sad the next time I see a hawk come down and get one. Your photos of them are great! I hope you have babies this spring too! The men can pick up some good points here from this sweet tutle doves...mate for life, its dear hubby do little housekeeping job at home and babysit too! I wish they will sit on my tree and make nests, I too want baby doves! Love your photos on them! We have Mourning Doves here too... I love their call. How sweet! 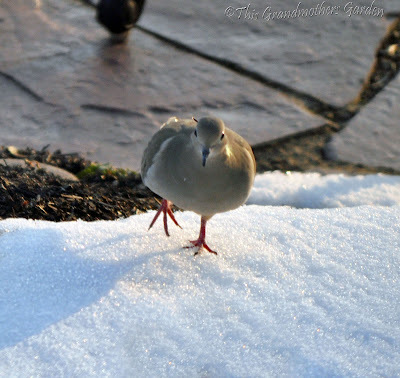 I like the photo of the dove lifting his foot out of the snow. We have mourning doves here, too. They are fun to watch. they must have found your garden so welcoming that they didnt want to leave! I remember my dad saying that they mate for life. You captured some beautiful photos, Carolyn! Have they overwintered for you in the past? Oh, this post is so special! 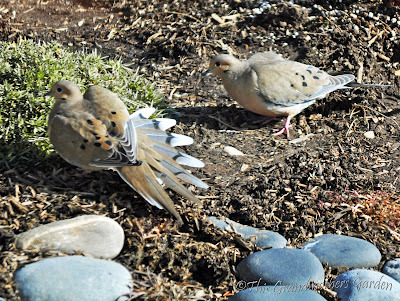 Mourning doves are a favorite of mine, too, for their peaceful cooing and beautiful feathers. I never knew about their mating for life and their nesting habits, now they are even more dear to me! Thrilled to see so many who adore these beautiful creatures as I do. Thank you for adding your thoughts! I never noticed them in my gardens last Winter, but I did discover them in early Spring of last year. Love their cooing sounds! We have three, one must be an adult child. They are sweet and kind to each other. I had a pair but the mate has gone missing. I suspect a neighborhood cat. Your photos are spot on and have lots of character. Hard to get some of those shots--love the one where you speak about them mating for life. You don't see those tail feathers very often. We also have mourning doves year round. I keep a bird house outside my office window to keep me a little in touch with nature while I am at work. 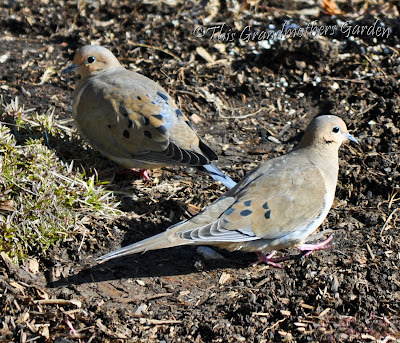 I sprinkle the ground around the feeder for the doves. They are very sweet. We also have turtle doves in Europe, but they have become very rare, which is a pity, as they are so delicate birds. 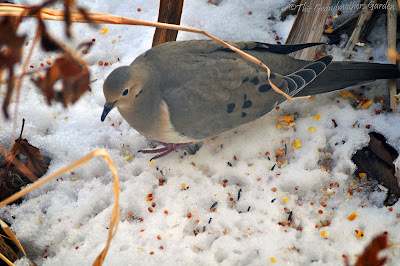 We have a lot of mourning doves that flock under our feeders to pick up what the other birds have dropped. I especially like their call, which is unlike any other bird.